This was my first machine project. 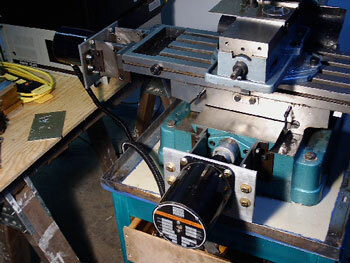 I want a small milling machine that I could put in my basement for hobby work. I purchased a new mill drill type machine on sale. I soon realized that it would be cool to have a CNC machine. I had acquired some stepper motors many years earlier that were being discarded. It seemed that these motors would have enough torque, 230 in-oz, for light duty work considering the 0.1" pitch lead screws. Also being interested in motor control I decided to build my own microstepping drive. 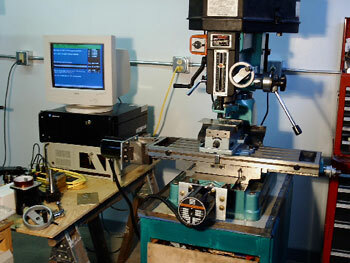 The CNC control was a PC DOS program called Turbo CNC from DAK Engineering. This program is designed to run stepper motors using the parallel port. Even though this machine used leadscrews with 0.025" of backlash, I learned that under some conditions reasonable results could be acheived. The turbo CNC program will compensate for backlash when reversing the direction of one of the axis. If the cut is shallow and there is enough table drag then a round cut will result as shown in the photo below. 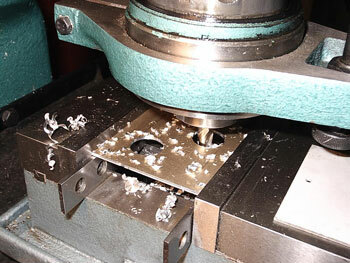 To cut a round hole and not have a 0.025 step at each of the 4 points where the axis reverses simply cut the hole or round opject first in the CW direction then repeat the operation in the CCW direction. 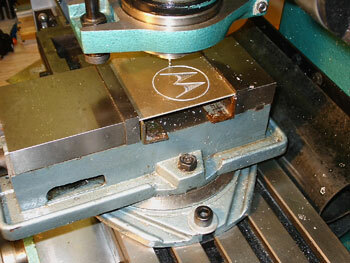 This double cut method will leave a small ~.003" step at each of the inflection points.